Cannes 2017 is just around the corner and as I keep saying with each day that it draws nearer it gets more and more glamorous. The gorgeous Isabelle Huppert has two films in two different sections that she is set to promote over the course of the festival and is slated to be honored during this years Kering Women in Motion Awards. Prior to her awards season run I just kinda looked over her on the red carpet, but she really delivered gorgeous effortlessly French looks on the red carpet during awards season and now I cannot wait to see what she will bring to the red carpets during her run at Cannes. Isabelle’s film Happy End is premiering in competition at this years festival and I would expect that of her appearances that this one will be the most glamorous. 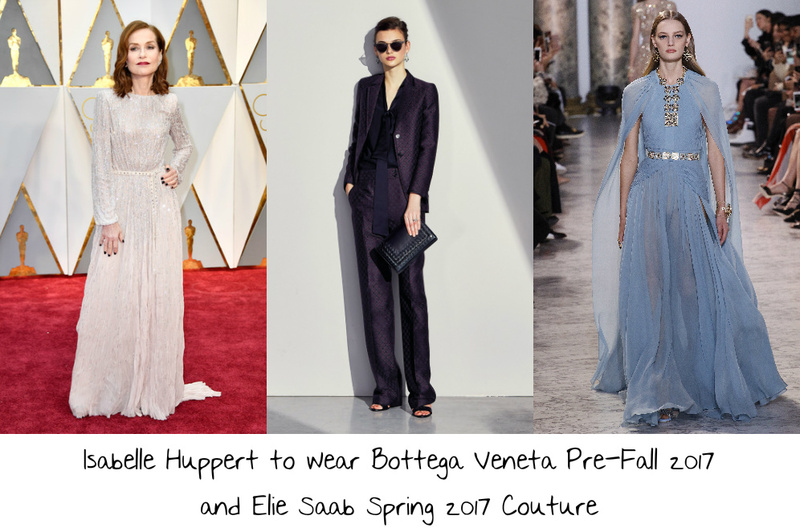 For the photocall I think we will see that relaxed elegance which Isabelle has become known for and I think that this purple silk brocade Bottega Veneta Pre-Fall 2017 suit which is paired with a navy silk blouse with a ribbon tie neck would be the perfect look for her to wear. This look is structured yet still evokes that effortless glamour that I love about Isabelle’s red carpet looks. A pair of black pumps and simple hair and makeup would ensure this look is perfect. For the premiere I want to see a much more dramatic side of Isabelle’s style. This light blue draped Elie Saab Spring 2017 Couture gown which features a beautiful cape and an embellished belted waist would be a perfect choice to showcase a much more dramatic side of Isabelle’s style. She has never worn Elie Saab before, but her stylist has with other clients so I think that there is still a chance. I think that Isabelle is one of the few people who could wear this gown without a parallel to the Valentino Couture gown that Jennifer Lopez wore to the Met Gala earlier this month. Rounding out this look with a dazzling diamond necklace, silver pumps, a red lip, and chic waves would make this a slam dunk day for Isabelle who I am sure is going to win the Cannes Film Festival red carpets. Heading into the Cannes Film Festival Emma Stone is currently leading the pack of contenders for the Red Carpet Diva of the Year. I have a feeling that over the course of the festival there are going to be a few people who are going to work to challenge that. I have a feeling that Fan Bingbing will be one of those who challenge Emma and I think that she has the potential to usurp the title. 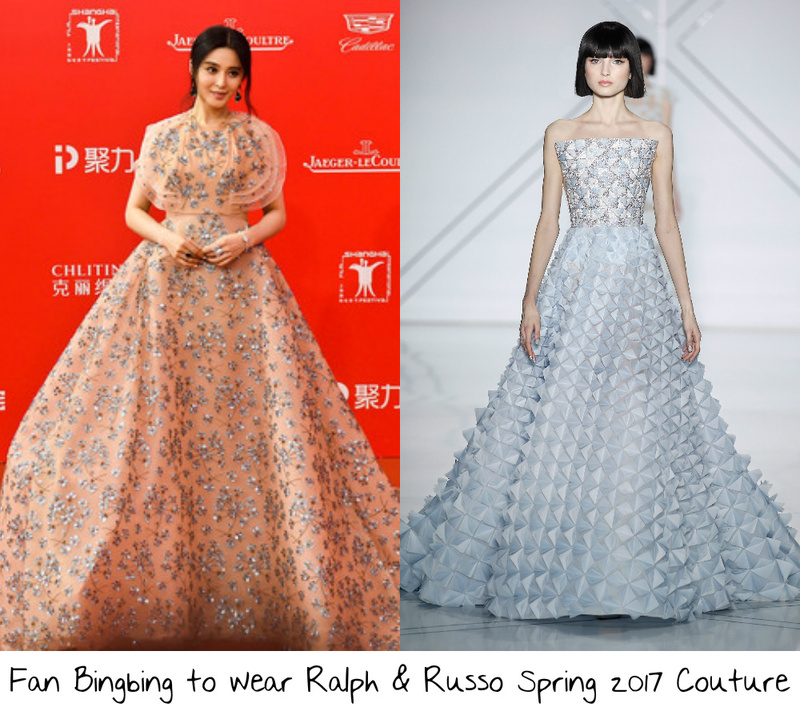 I may have put this gorgeous Ralph & Russo Spring 2017 Couture 3-D structured ball gown in my wishes for Sonam Kapoor to wear for her time at the festival for L’Oreal, but I also think that Fan would also look really gorgeous wearing this creation during Cannes. We know that Fan does princess gowns like no other on the red carpet and this gown is a very modern take on princess dressing. I think that on the red carpet at a premiere that Fan would just make jaws drop wearing this creation. Styling this look with a sleek updo, red lip, diamond cluster earrings, a dazzling diamond bracelet, and a pair of silver sandals would make this look total perfection for Fan. I also went along the princess line for my wish for Jessica Chastain. Although this grey Marchesa Pre-Fall 2017 ball gown which features a sweetheart neckline with thin beaded straps, antique silver embroidered bodice, and a full tulle skirt is very much a very classic interpretation of princess dressing. 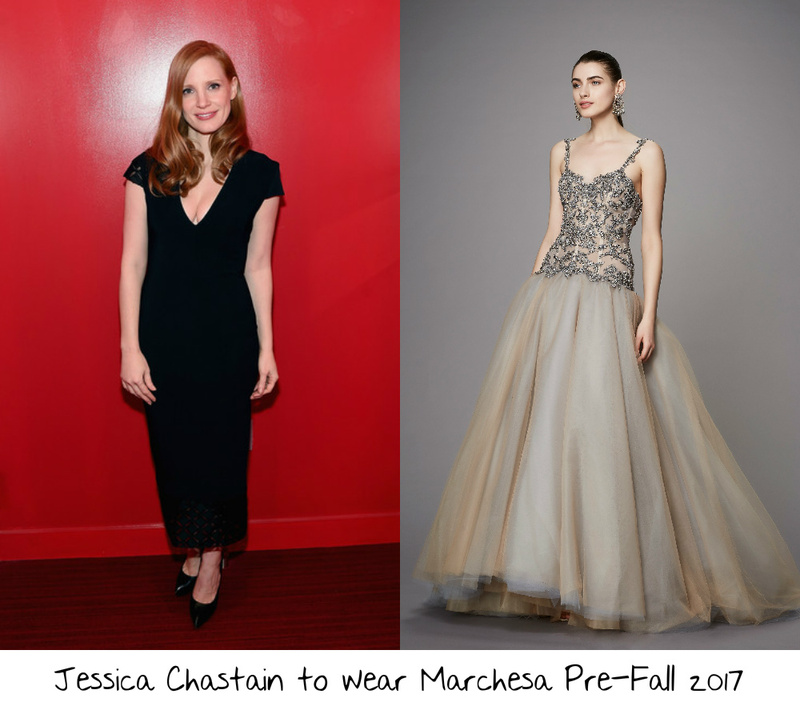 I couldn’t find any prior looks of Jessica wearing Marchesa on the red carpet, but I think that for the Cannes Film Festival that this would be a beautiful look for a premiere. I want to see Jessica every single day during the festival, so maybe we will see her in a new look or two over the course of this years edition. This gown paired with dainty diamond earrings, a romantic updo, soft makeup, and a pair of grey sandals would ensure that this look is an absolutely major moment on the red carpet at the Cannes Film Festival. 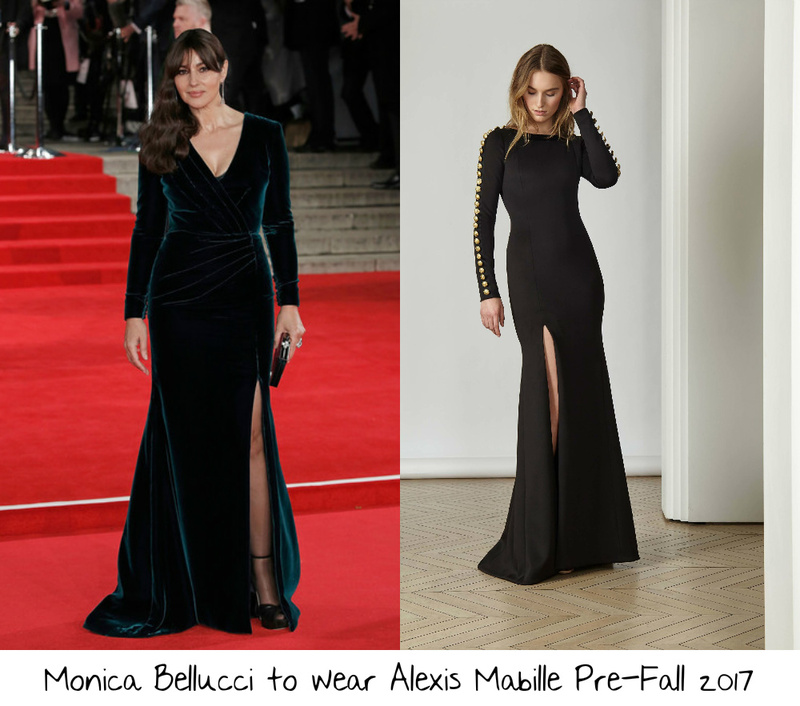 When it comes to her red carpet style Monica Bellucci can be pretty predictable. During her reign at the Cannes Film Festival as the Mistress of Ceremonies that we see a little variety in style and designer from her red carpet looks. This wish for Monica to wear during this years festival is in her style wheelhouse but from a new designer. I think that Monica would look lovely wearing this black Alexis Mabille Pre-Fall 2017 fitted gown which features a crew neckline, full length sleeves, gold button embellishment, and a slit at the leg. Like I said, the style is nothing new for Monica, but I still think that I would find this look gorgeous. The gold button detail elevates this look just enough to not allow it to be boring. To round out this look I would add old Hollywood waves, a red lip, smokey eye, black clutch, and a pair of black sandals. The premiere of Happy End will take place on Monday May 22, 2017 during the 2017 Cannes Film Festival which opens on Wednesday May 17 and runs through Sunday May 28, 2017.